For years, MySQL replication used to be based on binary log events - all a slave knew was the exact event and the exact position it just read from the master. Any single transaction from a master may have ended in different binary logs, and in different positions in these logs. It was a simple solution that came with limitations - more complex topology changes could require an admin to stop replication on the hosts involved. Or these changes could cause some other issues, e.g., a slave couldn’t be moved down the replication chain without time-consuming rebuild process (we couldn’t easily change replication from A -> B -> C to A -> C -> B without stopping replication on both B and C). We’ve all had to work around these limitations while dreaming about a global transaction identifier. GTID was introduced along with MySQL 5.6, and brought along some major changes in the way MySQL operates. First of all, every transaction has an unique identifier which identifies it in a same way on every server. It’s not important anymore in which binary log position a transaction was recorded, all you need to know is the GTID: ‘966073f3-b6a4-11e4-af2c-080027880ca6:4’. GTID is built from two parts - the unique identifier of a server where a transaction was first executed, and a sequence number. In the above example, we can see that the transaction was executed by the server with server_uuid of ‘966073f3-b6a4-11e4-af2c-080027880ca6’ and it’s 4th transaction executed there. This information is enough to perform complex topology changes - MySQL knows which transactions have been executed and therefore it knows which transactions need to be executed next. Forget about binary logs, it’s all in the GTID. So, where can you find GTID’s? You’ll find them in two places. On a slave, in ‘show slave status;’ you’ll find two columns: Retrieved_Gtid_Set and Executed_Gtid_Set. First one covers GTID’s which were retrieved from the master via replication, the second informs about all transactions which were executed on given host - both via replication or executed locally. 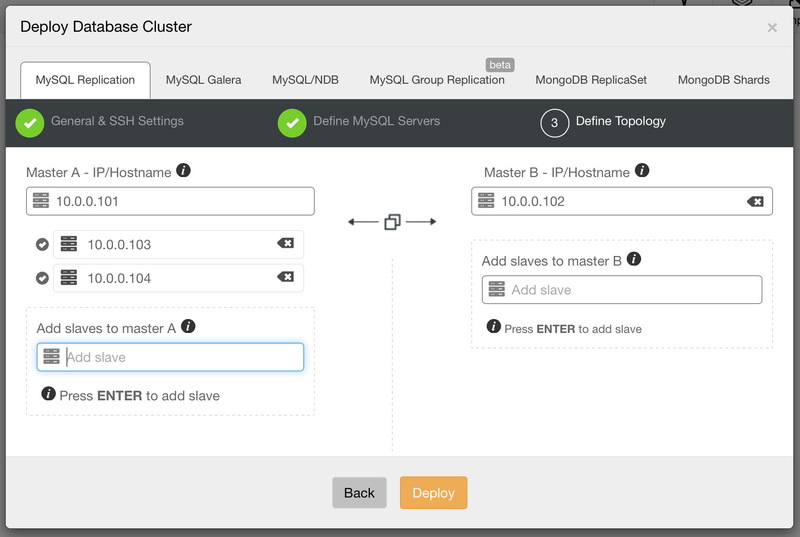 Deployment of MySQL replication cluster is very easy in ClusterControl (you can try it for free). 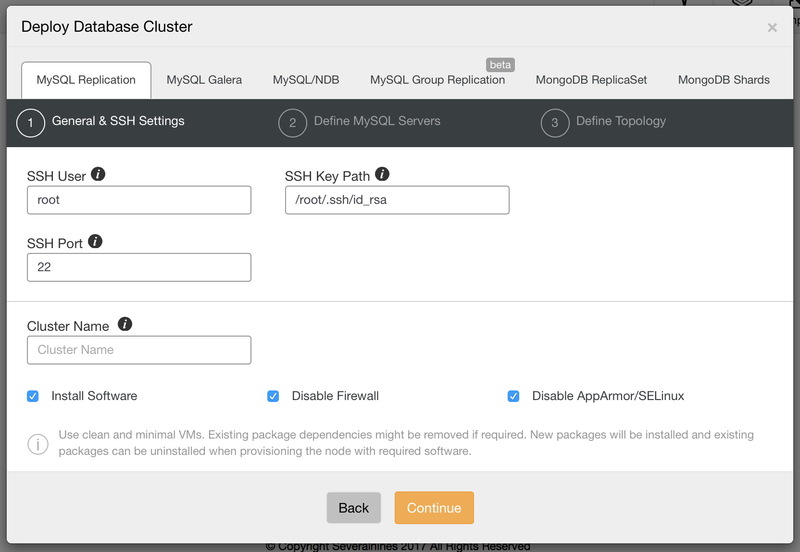 The only prerequisite is that all hosts, which you will use to deploy MySQL nodes to, can be accessed from the ClusterControl instance using passwordless SSH connection. When connectivity is in place, you can deploy a cluster by using the “Deploy” option. When the wizard window is open, you need to make couple of decisions - what do you want to do? Deploy a new cluster? 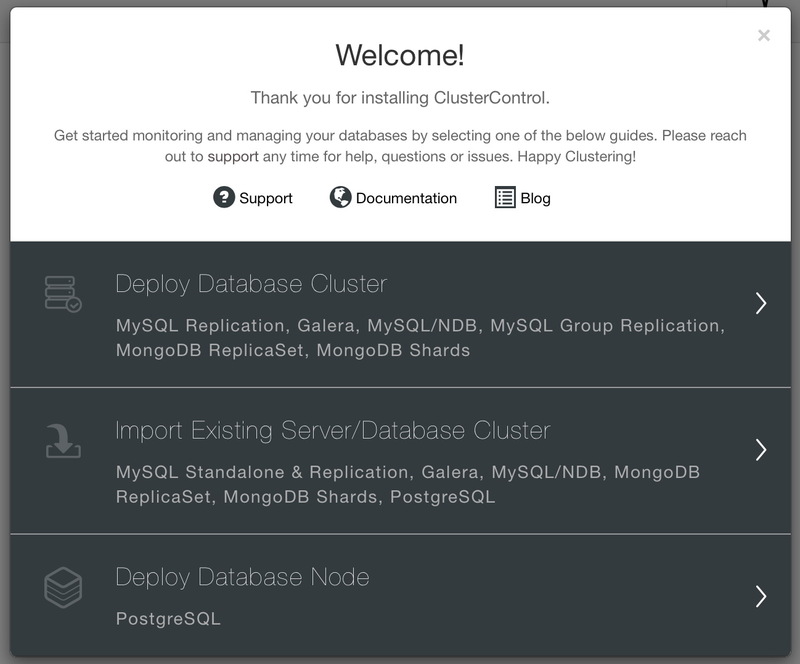 Deploy a Postgresql node or import existing cluster. We want to deploy a new cluster. We will then be presented with following screen in which we need to decide what type of cluster we want to deploy. Let’s pick replication and then pass the required details about ssh connectivity. When ready, click on Continue. This time we need to decide which MySQL vendor we’d like to use, what version and couple of configuration settings including, among others, password for the root account in MySQL. Finally, we need to decide on the replication topology - you can either use a typical master - slave setup or create more complex, active - standby master - master pair (+ slaves should you want to add them). Once ready, just click on “Deploy” and in couple of minutes you should have your cluster deployed. 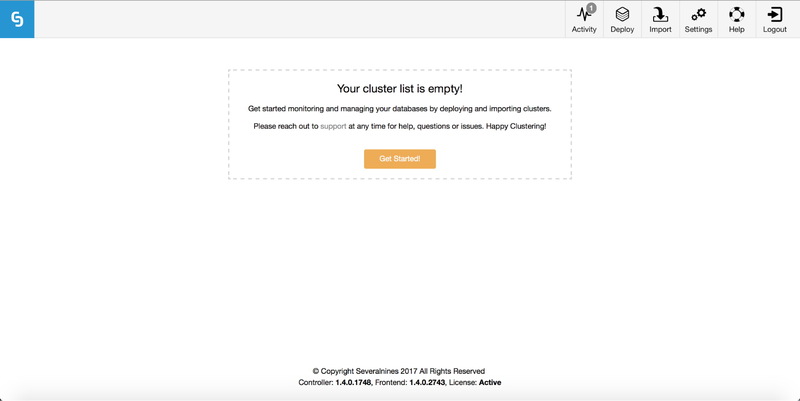 Once this is done, you will see your cluster in the cluster list of ClusterControl’s UI. Having the replication up and running we can take a closer look at how GTID works. Errant transactions - what is the issue? Both ways should bring replication back to work, but they may introduce data drift so it is necessary to remember that slave consistency should be checked after such event (pt-table-checksum and pt-table-sync works well here). If a similar problem happens while using GTID, you’ll notice some differences. Deleting the offending row may seem to fix the issue, replication should be able to commence. The other method, using sql_slave_skip_counter won’t work at all - it’ll return an error. Remember, it’s now not about binlog events, it’s all about GTID being executed or not. Our missing GTID’s are ab8f5793-b907-11e4-bebd-080027880ca6:3-4 - those transactions were executed on the slave but not on the master. There are two ways - inject empty transactions or exclude transactions from GTID history. This has to be executed on every host in the replication topology that does not have those GTID’s executed. If the master is available, you can inject those transactions there and let them replicate down the chain. If the master is not available (for example, it crashed), those empty transactions have to be executed on every slave. Oracle developed a tool called mysqlslavetrx which is designed to automate this process. Set GTID_PURGED to a correct GTID set. based on data from SHOW MASTER STATUS. You should exclude errant transactions from the set. In every case, you should verify consistency of your slaves using pt-table-checksum and pt-table-sync (if needed) - errant transaction may result in a data drift. 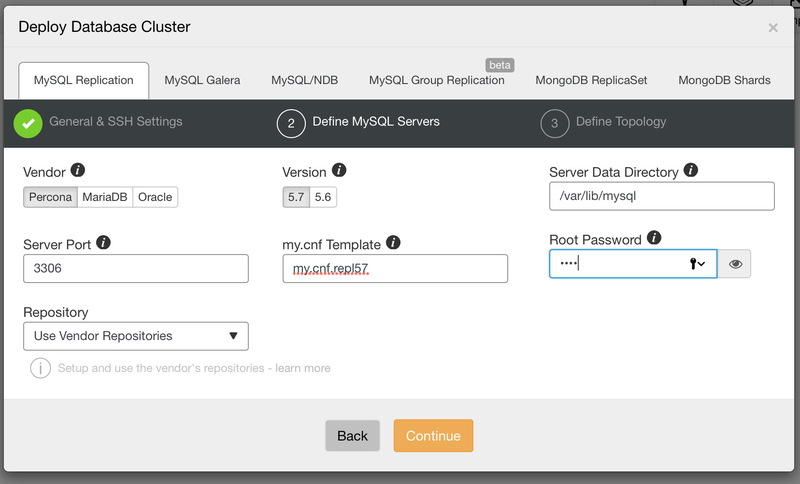 Starting from version 1.4, ClusterControl enhanced its failover handling processes for MySQL Replication. You can still perform a manual master switch by promoting one of the slaves to master. The rest of the slaves will then fail-over to the new master. From version 1.4, ClusterControl also have the ability to perform a fully-automated failover should the master fail. We covered it in-depth in a blog post describing ClusterControl and automated failover. We’d still like to mention one feature, directly related to the topic of this post. By default, ClusterControl performs failover in a “safe way” - at the time of failover (or switchover, if it’s the user who executed a master switch), ClusterControl picks a master candidate and then verifies that this node does not have any errant transactions which would impact replication once it is promoted to master. If an errant transaction is detected, ClusterControl will stop the failover process and the master candidate will not be promoted to become a new master. If you want to be 100% certain that ClusterControl will promote a new master even if some issues (like errant transactions) are detected, you can do that using the replication_stop_on_error=0 setting in cmon configuration. Of course, as we discussed, it may lead to problems with replication - slaves may start asking for a binary log event which is not available anymore. Such a setting may not always be appropriate as the rebuilding process will induce an increased load on the master. It may also be that your dataset is very large and a regular rebuild is not an option - that’s why this behavior is disabled by default.